Finding an architect or interior designer who can merge the best of the surrounding landscape with the creative vision of a new property is quite the feat. 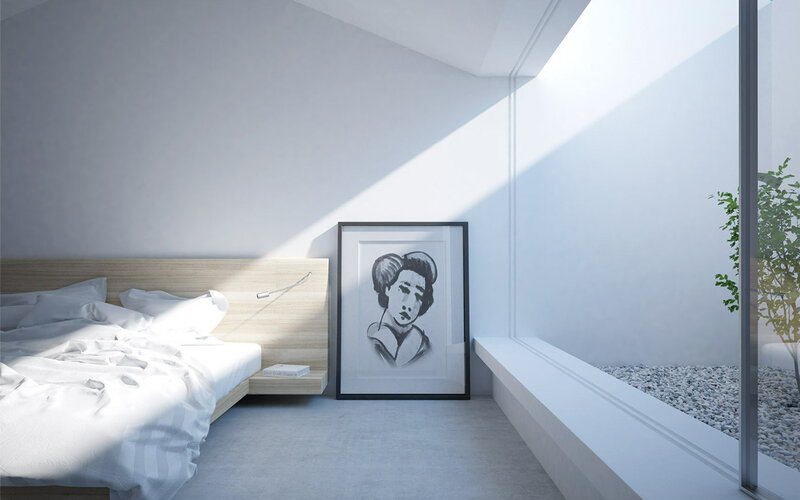 Luckily, we can see this perfectly in three examples of renderings by Terri Brown. This first set of renderings shows a private home on the beautiful island of Mayotte. The property is unique in that it focuses more on the surrounding environment than on the space itself. Nature flows into the property seamlessly, as the lounge and deck are designed to merge into a centralized living space, offering breathtaking views of the surrounding sea. It’s easy to imagine sea breezes and warm sunlight being taken in at every turn. This first home looks ideal for family holidays or entertaining, or perhaps a romantic retreat. 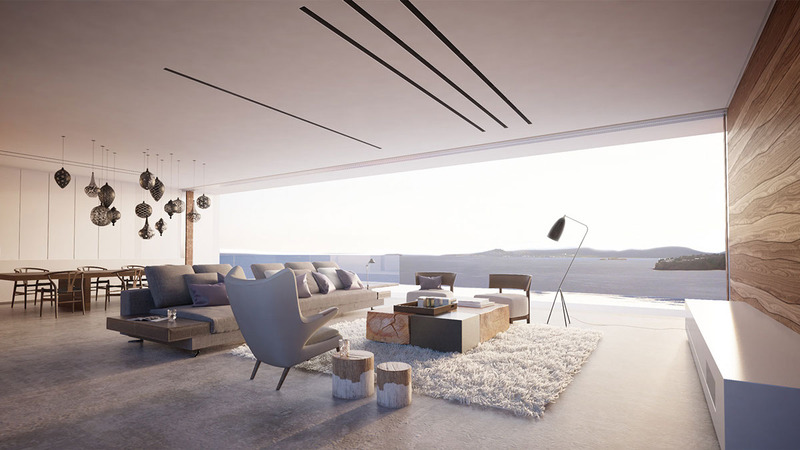 A large contemporary living area offers a stunning panoramic view. The open floor plan allows for easy entertaining as it blends together living and dining areas, all while letting the large panoramic window be the star of the space. 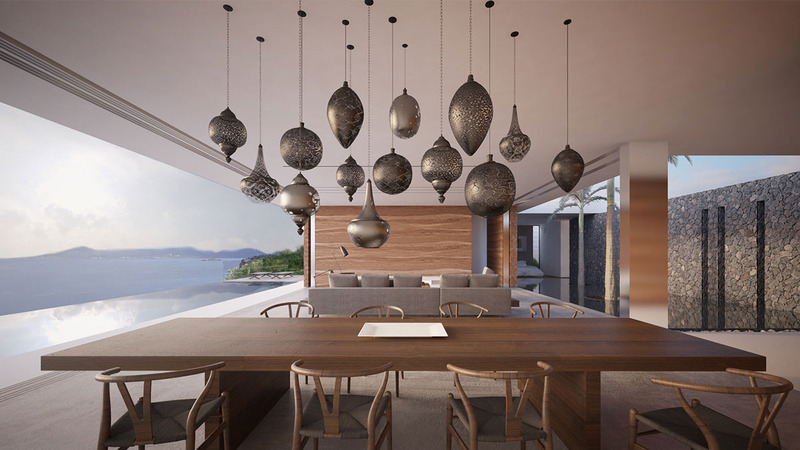 Above the dining table, a unique series of pendant lights create a focal point to delight in. 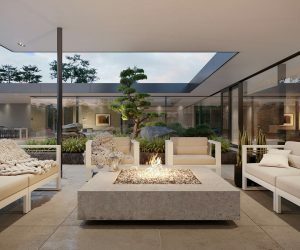 Lit by only the night sky and a few outdoor lanterns, the clean lines of the space make it feel airy, open, and almost limitless. 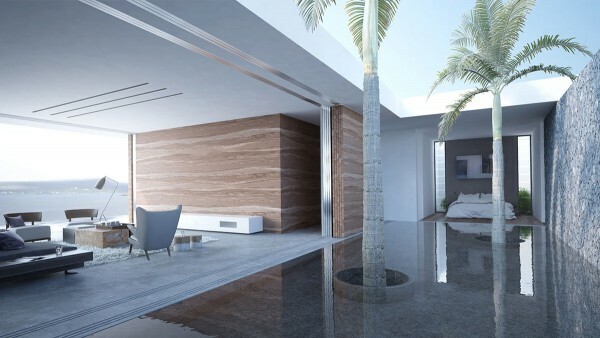 Squares and clean lines dominate the floor plan. A unique palm tree grows in the open walkway between the living and bedroom areas. The bedroom feels serene, as natural fibers, crisp white walls, and plenty of natural light combine together. 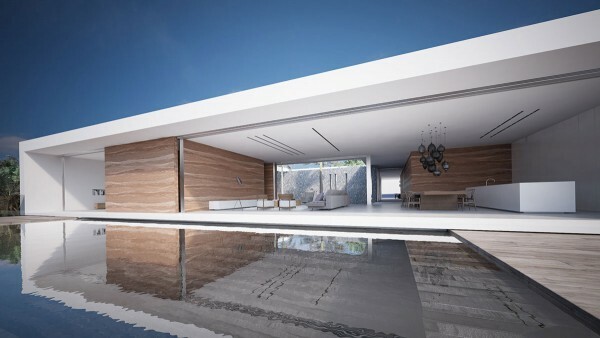 The glassy reflection of the home from the pool only adds to the geometric mystique of the property. Each room offers panoramic views with floor to ceiling windows. Simply breathtaking. 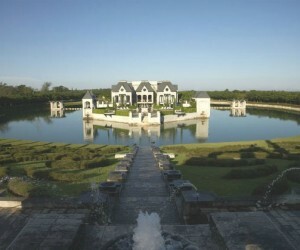 The second property is regarded as one of the most highly sought after in Mauritius. It’s located at the base of the famous Le Morne mountain. All of the nearby homes blend naturally into the landscape and provide exceptional views over the bay, which is something that was kept into consideration in the design of this space. This property is designed to blend into the mountainside while offering stunning views and luxurious accomodations. Warm woods lend comfort to the living area while large windows let the stunning view speak for itself. 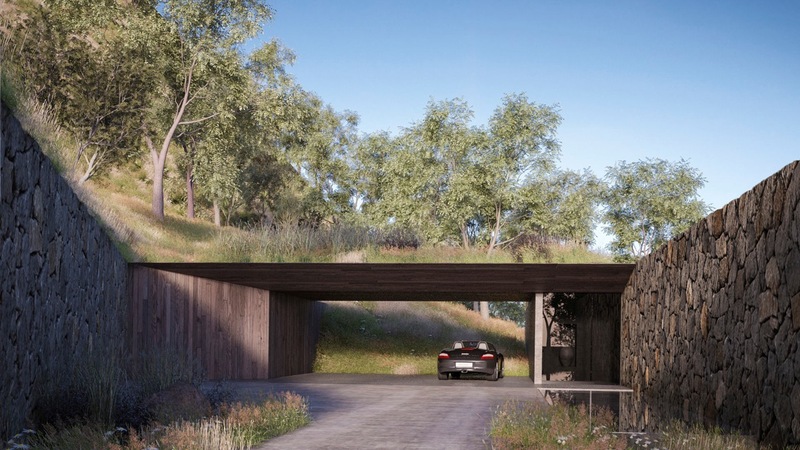 Blending earth and sky, this property uses natural woods, stone, water, and a low-profile design to blend into the surrounding mountain landscape. 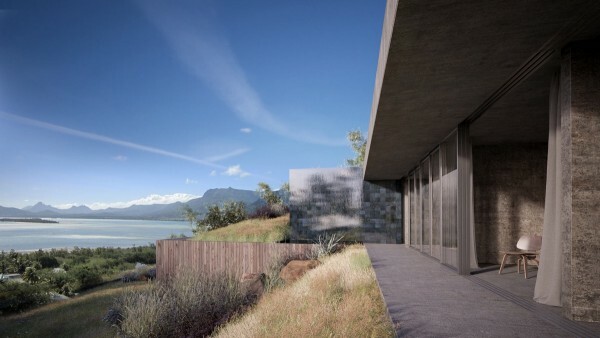 Open to the surroundings yet with a feel of privacy, this space is a stunning mountain retreat. 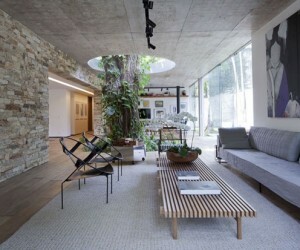 Nature here also blends into the living space, with lush gardens, lots of natural light, and an open design that makes connecting indoor and out only a step. 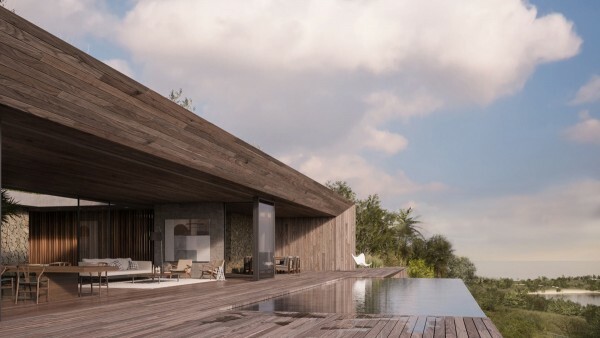 One of the more unique features of this property is the use of natural materials throughout. 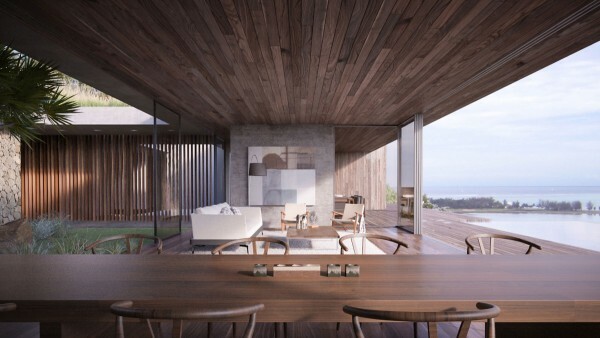 Warm woods are showcased in both the walls and ceilings. 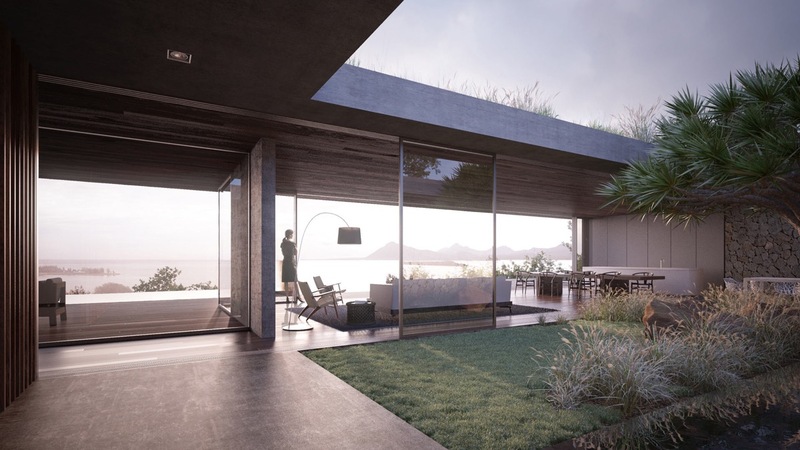 Le Morne’s stunning views and natural flora are highlighted throughout these renderings. 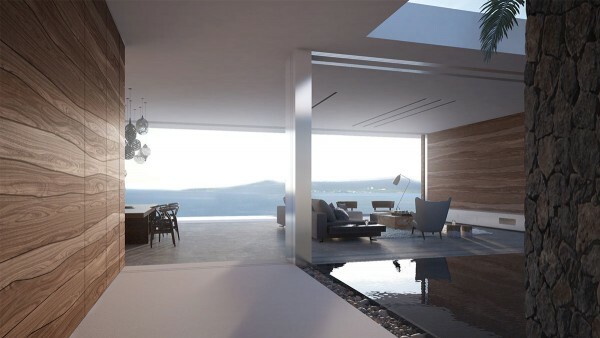 Glass allows light to flood the rooms. 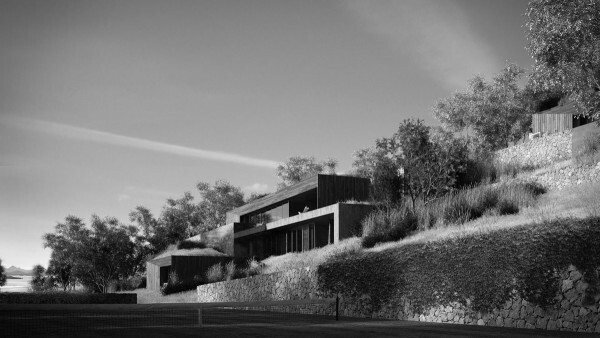 Stone walls along the outdoor parking area keep the property from feeling intrusive. Furnishings are kept simple. Everything is low profile, allowing for the beauty of the mountain to take hold of any visitor. While it may not be in the traditional lodge style, this contemporary mountain retreat certainly feels like it unifies both earth and sky. Dramatic in black and white, this Le Morne property is a mountain retreat that takes the breath away. 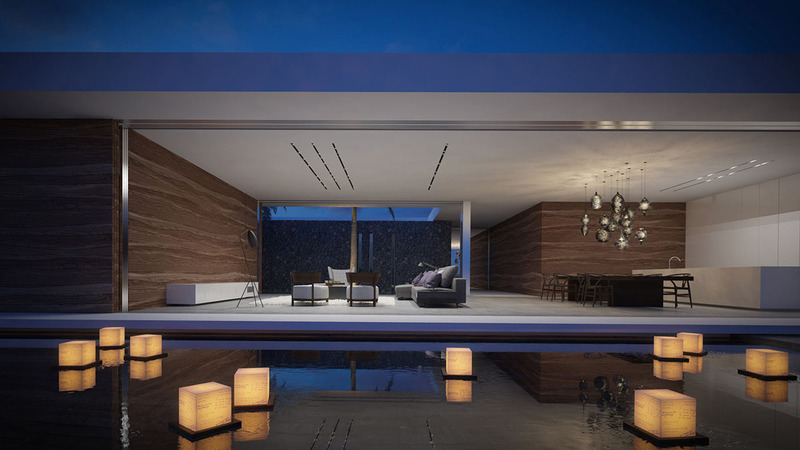 Finally, the third property is all about serenity. 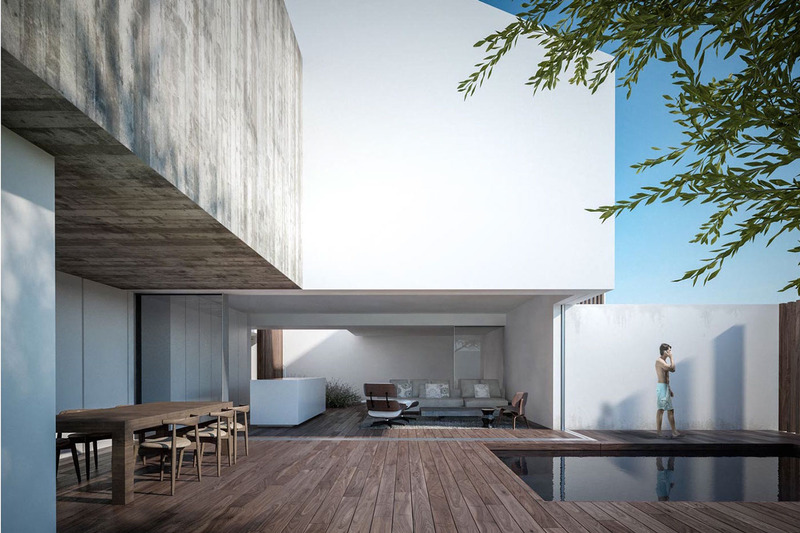 A family home, it offers the best of form and function, with colors inspired by the sea and the use of natural materials throughout. 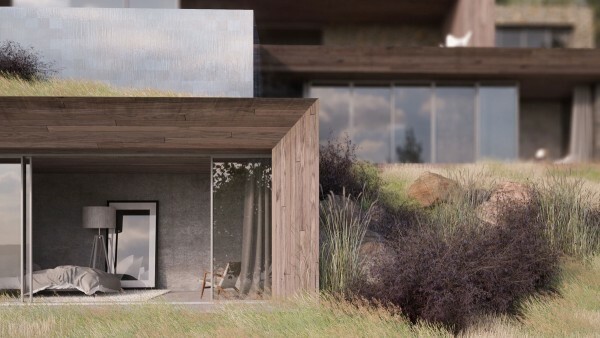 Like the other designs, there’s plenty of natural light and an appreciation for the surrounding landscape. 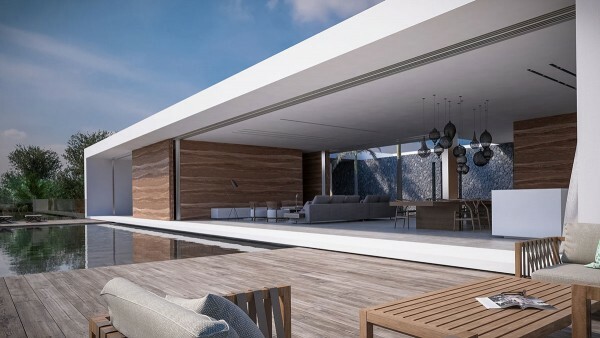 It’s easy to relax in this serene, contemporary home. 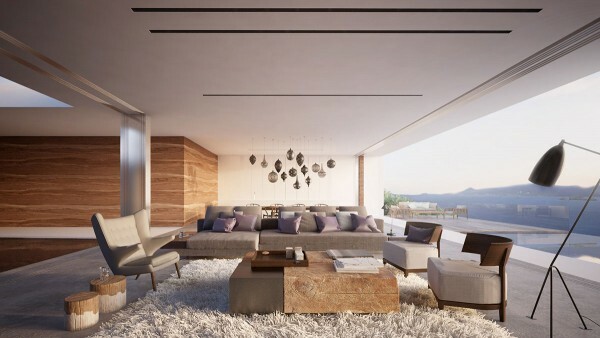 Light streams in from multiple angles in this gorgeous living area. The colors used throughout the living areas are reminiscent of shades found at the beach, with sand, seaglass, driftwood, and white all showcased in furnishings. 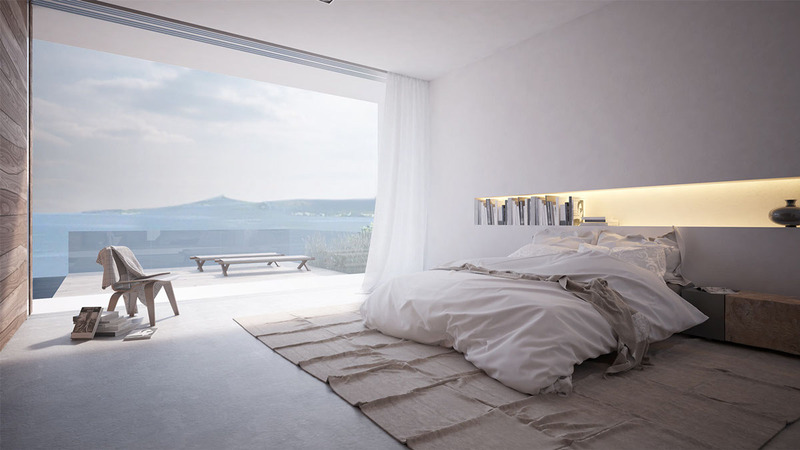 Simplicity makes this room striking. Statement artwork in simple black and white lends a surprising element to the soothing palette of light woods and natural linens.